"I had always wanted to follow in my father's footsteps and become an engineer," he says, "but my engineering teacher in Greece suggested that electronics was perhaps too broad a topic to study at degree level. I love the topic though, and wanted to study something closely related, so telecommunications was a natural progression for me." Anastasios did some research through Google and found the BEng (Hons) Telecommunications Engineering degree at LSBU. "I applied through UCAS and was delighted to be accepted onto the course and start my studies in London," he says. Having settled into his studies, Anastasios found himself intrigued by the opportunity of studying part of his degree in another country through the Erasmus programme. "I'd already heard about Erasmus – we all had," he says, "but I asked the Erasmus officer at LSBU and she explained it all in much more detail for me. It sounded really exciting, and I decided that it was definitely something I would like to pursue." Erasmus is the European Commission's flagship educational program and provides HE students with the chance to take a work placement or study abroad as part of their degree. It was an experience that appealed to Anastasios for a number of different reasons. "Travel, studying abroad, living and studying in a different country and meeting new people were all things that interested me, and led me to apply," he says. "I was nervous about it at start, and thought that my application was not very likely to succeed, but I talked to some of my fellow students and they made my mind up to go for it – and I'm glad they did!" After being accepted onto the programme, Anastasios was given the chance to spend part of his degree studying at the University of Bremen in Germany. "At first, I found it difficult – it was a strange feeling and I felt a little cold towards the university in comparison to the way I felt about LSBU," he recalls. "Bremen is a small city compared to London, and the university was very different. 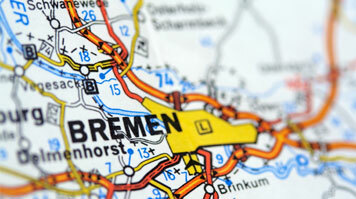 However, after a month living in Bremen I really settled in and realised how wrong my first impressions had been." Learning German certainly helped Anastasios to make new friends in Bremen – he studied the language for one semester – but he also made great friends from around the world. "It was an amazing experience," he recalls. "We became like a family in a very short time, and when we had finished studying we travelled around Germany and Europe together." Anastasios believes that his time in Bremen not only helped make some incredible new friendships, but has also helped his career plans too. "We all know what good engineers Germany produces," he says. "While I was there, I visited lots of engineering companies in Bremen and made useful contacts. It was very helpful, and I enjoyed myself so much during my time there that I am considering going back there to work and live."